Our 6000 Series of Extra Heavy Duty Fabricated casters are for extreme applications. These casters are thick plate steel, welded and chromatised for added corrosion protection. With caster load ratings from 320kg each up to 1.7tonnes each, these fabricated casters are the backbone for gantry's, cargo and docks, refineries, marine applications, containers and furnaces. The most popular fabricated caster being the polyurethane version. 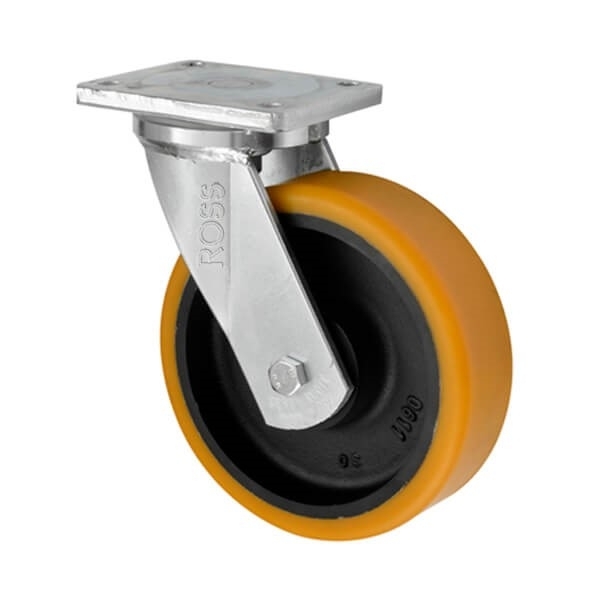 This caster has a cast iron core with a bonded and extremely durable polyurethane wheel. The extremely heavy duty polyurethane wheel and the fabricated caster housing combination produces a caster that can take weights of over one and a half tonnes each. Put four of these casters on an a frame or gantry and they can manoeuvre weights of up 5 tonnes in total. 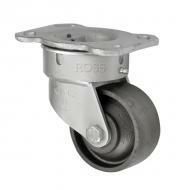 Fabricated casters can be supplied either in a swivel fabricated housing, fixed or with a brake. The foot operated braked caster simultaneously brakes both the wheel and the fabricated swivel head. A real heavy weight champion of the Ross Caster Range!